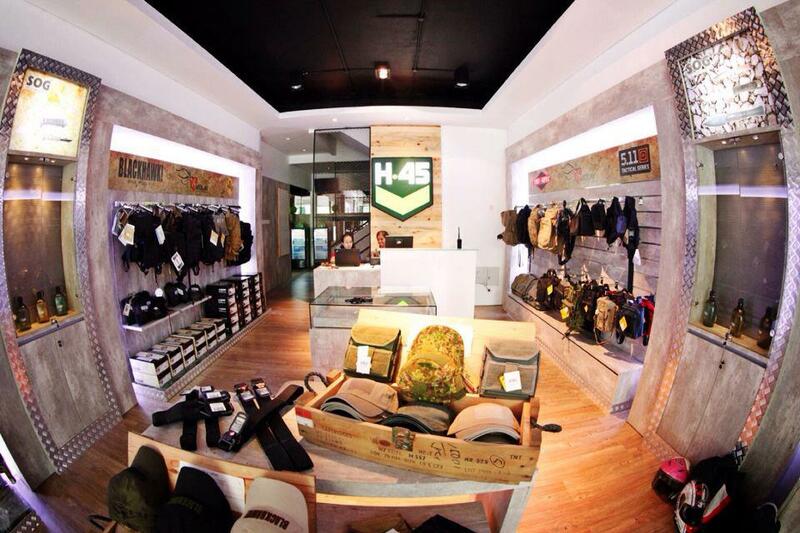 Indonesian entrepreneur, military uniform collector, and self-confessed camouflage addict, Arie Setya Yudha, passed a significant milestone last week when the “H.45″ retail store opened as his agent in Jakarta. 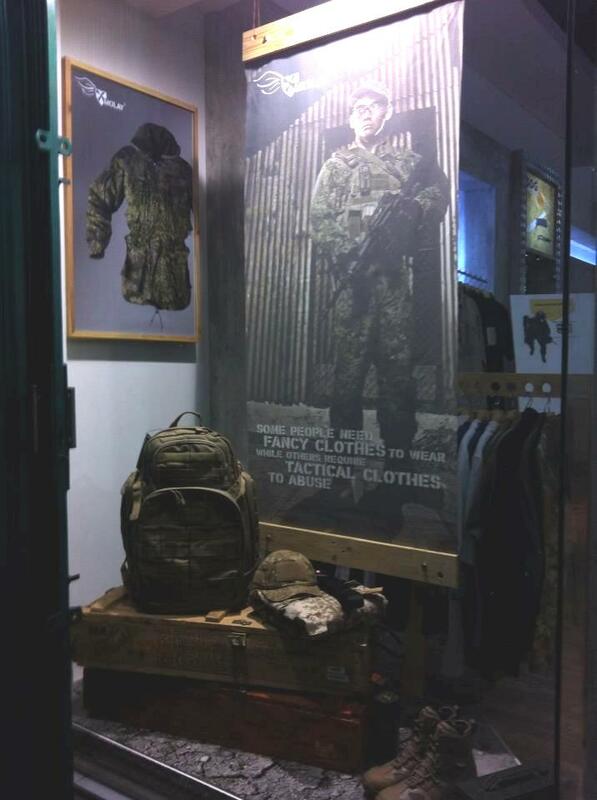 Arie’s company Molay Military Uniform Division aims to provide comfortable, durable, efficient military-grade garments and gear for real-deal and mil-sim tactical use. The company’s focus is 100% on function not fashion and every piece in their range is designed and crafted in Indonesia, using top quality materials sourced globally. 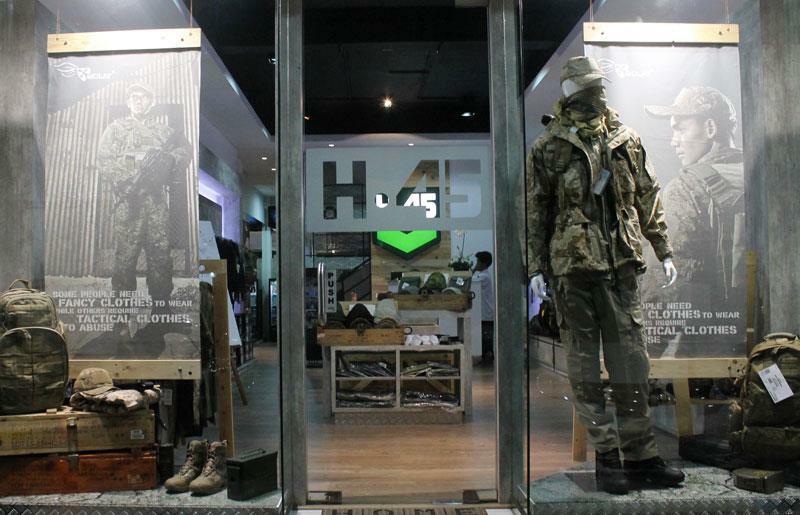 The H.45 store takes its name from the first letter of a well-known Indonesian war cry, and from 1945 – the year that Indonesia declared its independence from The Netherlands. And .45 is of course also the calibre of a certain legendary pistol. 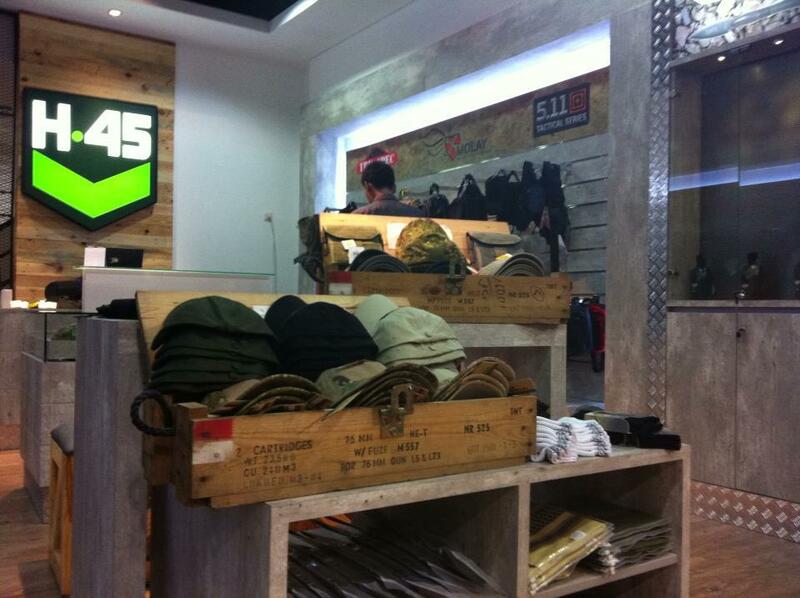 Arie and his business partners put all of these elements together, and created what is probably the coolest and most modern-looking store for tactical goods that we have ever seen. There are plans afoot for H.45 to also have an e-commerce enabled website in the not too distant future. 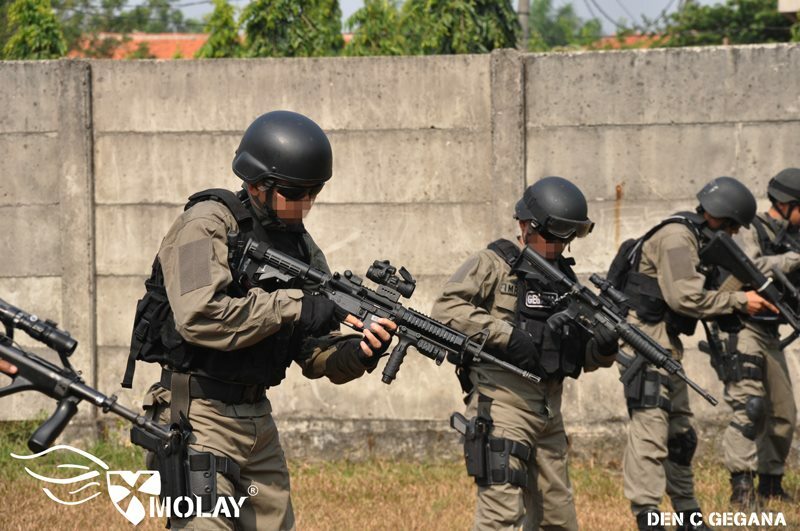 In the meantime, Molay Military Uniform Division has also had success in designing a new tactical uniform for the Indonesian National Police’s “Gegana” SWAT unit – known as the Peacekeeping Uniform (or PKU). 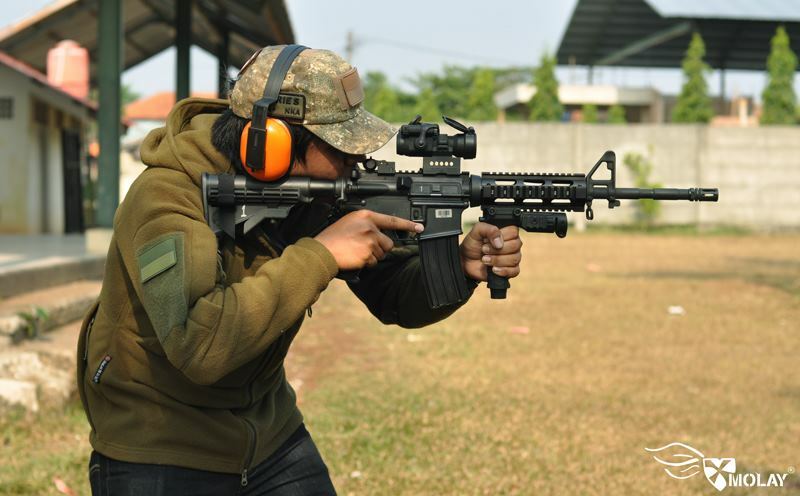 The PKU is also available commercially in PenCott camouflage patterns, and is already selling well in Indonesia and beyond. Check out Molay Military Uniform Division on Facebook for full details about the PKU. 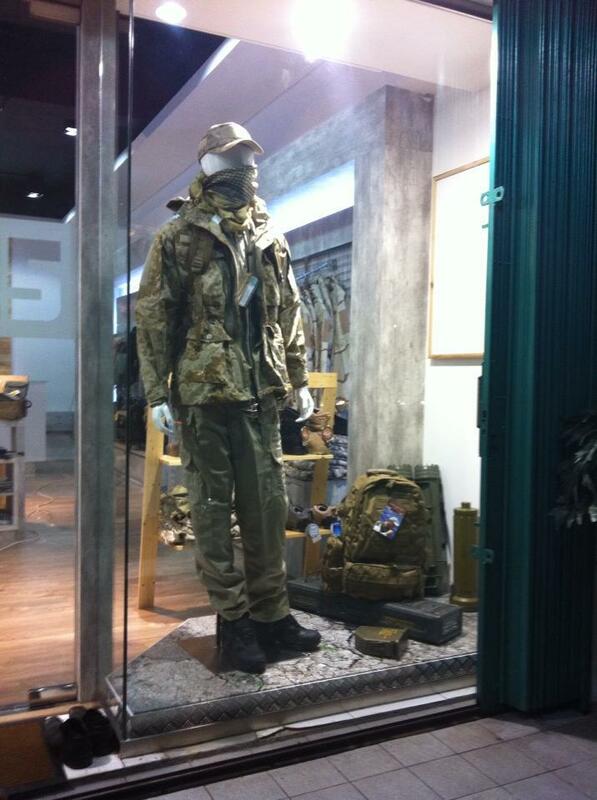 Molay has sent us the details of their new PenCott portfolio which now includes 2 different types of uniforms / tactical clothing, a combat shirt, a plate carrier and a boonie hat. “Rapid Task Trousers”: Designed to be paired with the Echo Tac 1 Jacket, this is Molay’s ultra-modern multi-purpose tactical trouser design. The trousers feature articulated knees for comfort and dynamic movement, as well as some clever and unique pocket designs and configurations for effective load carriage. Price for a pair in PenCott is $170 US, available to order now. Full details can be found on Molay’s Facebook page here. 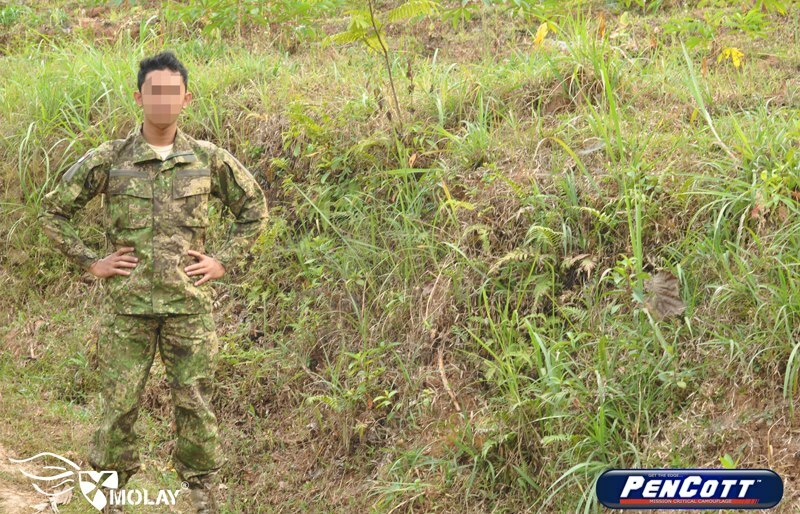 “Peacekeeper Uniform”: Designed at the request of an Indonesian law enforcement special operations unit, the Peacekeeper is Molay’s innovative take on a modern ACU / MCCUU type uniform suitable for garrison duty as well as field and tactical deployments. Price for a set is approximately $170 US (depending on current exchange rates), available to order now. Full details can be found on Molay’s Facebook page here. “RapidTask Top”: The Rapid Task Top is Molay’s re-interpretation of the USMC’s FROG shirt. Molay’s shirt features nIR-reflectance resistant PenCott NyCo ripstop fabric on the sleeves, collar and zipper placket and Cordura® Baselayer fabric on the torso. Price is $105 US, available to pre-order now. Full details can be found on Molay’s Facebook pre-order page. “Alpha Plate Carrier”: Molay’s first foray into “hardwear” is the Alpha Plate Carrier. Robustly constructed to hold up under heavy use, the Alpha features 1000D Cordura nylon with a durable water resistant finish and urethane backing, as well as US milspec buckles, webbing, mesh, Velcro, shock cord and snaps. The production version will feature breathable padded mesh on the interior – picture is of a prototype. Price will be approximately $170 US (depending on current exchange rates), available to pre-order now. Full details can be found on Molay’s Facebook pre-order page. “Tango Brim Hat”: Molay’s boonie hat is of the short-brimmed “operator” style that’s popular these days. The 55mm short brim is also angled in order to provide more protection from sun, rain and creepy-crawlies and the brim is also chain-stitched for additional stiffness. Molay also replaced the traditional (and clumsy / uncomfortable) chin strap with a shock-cord and cord-lock system to fasten the hat securely around the wearer’s head. The price is $30 and its available to order now. Full details can be found on Molay’s Facebook page, here.